Getting your first permanent, full-time job in your dream career can be tough. Often students apply for hundreds of jobs before they make their first break, others end up starting in an entirely different career. Many job adverts ask for a minimum level of experience, making it even harder for a graduate to find a suitable position. It can be disheartening trying to break into the work market, to try and stand out from the crowd and be noticed. We have a solution for you! Time spent studying and working abroad in an internship can make all the difference when it comes to your dream career. In fact, knowing more languages and having an international mindset is an asset for the increasing number of companies who are operating seamlessly across borders. Yes, studying and working abroad can help you learn new and valuable skills, grow personally and get that much sought after experience needed to help you get your career started. Travel, adventure, and fun are waiting for you. Studying abroad is your chance to seize life with both hands and experience a different life. Immerse yourself in a new culture, learn how the other side of the world lives and broaden your horizons. Develop your confidence, be more independent and learn new things. Get to know yourself better than you ever have. Spending time, living, and learning in a new country with people from across the globe will create bonds for life. China is a diverse country blending rich history with a cutting-edge modern lifestyle. See all the wonders China has to offer. Whether you’re a complete novice or are expanding your knowledge of Mandarin, you’ll accelerate your learning immensely. Pair your Chinese learning experience with an Internship in China and gain invaluable international working experience that will enhance your resume. It’s time to transform your life, change your future and have the time of your life by experiencing what it’s like to study and take an internship abroad. Why come to China to Learn Chinese? Why should you learn Mandarin Chinese, and more so, why you should come to China to learn it? Experience one of the world’s oldest civilizations juxtaposed with modern living; get immersed in the vibrant sights, sounds and flavors of China, they’re unique! See some of the world’s oldest buildings, meet endangered pandas, explore the vast regional areas of China that range from mountains to deserts, and get the chance to see record-breaking bridges and futuristic architecture. Many companies across the globe, especially multinational corporations either have a presence in China or do business with China. The demand for English/Mandarin Chinese speakers is high, but the number of people who are fluent in both is low. This opens up incredible opportunities for your future! Getting to know a new culture will result in personal and professional development. Being able to understand another culture will help you predict and understand their behaviors, it will help you understand their viewpoint better. With China having such an influence across the world, being able to understand and work Chinese businesses can be a massive career advantage. Many graduates start work with little or no work experience and are not prepared for the workforce. An internship is a great way to gain practical experience, so you are work-ready when the time comes to look for a full-time position. 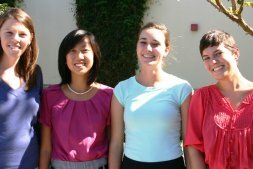 An internship can help you get your foot in the door - many of our interns have been offered permanent positions at their internship company once their program was complete. Learning to navigate the workforce and cope with different situations, especially if you are in another country learning a new culture, can teach you how to navigate and adapt to different situations. You’ll learn how to be diplomatic in your communications as you begin to understand working with people who have a different background and values to yourself. When you leave university, you may not have a clear picture of what you want to do, what type of position you’d like or which industry you’d like to work in. Learning about an industry and working in it can also be worlds apart. An internship allows you to test the waters and see whether a particular role or industry meets your expectations and if you’d like to work in it permanently. Go Abroad China offers a broad range of programs for students and graduates looking for that extra edge on the résumé. We’re a one-stop platform that lets you choose from a variety of program types, or mix them up to get a broader experience. All our programs include social, cultural and networking activities to ensure you get the most of your time here and can fully immerse yourself in the Chinese lifestyle. This adds fun, helps you grow personally, and teaches you about the Chinse way of life and business. It will probably surprise you that English is not the most spoken language in the world! It is, in fact, Mandarin. Not only that, the demand for bilingual people who can speak both English and Mandarin is growing as more and more companies do business with China, have offices there or trade with China. Find adventure and accelerate your Chinese language proficiency by coming to study Mandarin Chinese in one of our high-quality Chinese language programs. When you study abroad, you get to immerse yourself in another culture and learn the language much faster than studying in your home country. Please click Go Abroad China Learn Chinese Program for details. China has the largest and fastest growing economy in the world. Go Abroad China arranges paid Internships for our participants with a range of companies, from small start-ups to large, multinational corporations. When you Intern abroad in China, you gain international work exposure and learn the most spoken language in the world: Mandarin. The experience and knowledge you will gain will change your perspectives on life and set you up for a global career. Please click Go Abroad China Internship Program for details. What better way to spend your Gap Year than in the exchange of languages? 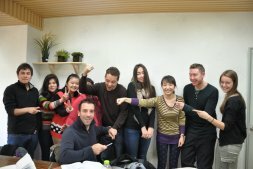 Come and spend your Gap Year teaching in China and share your language with us, while we teach you ours! 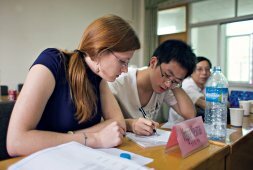 Go Abroad China can organize a range of teaching opportunities for both qualified teachers or people with no teaching experience at all. Our Teaching Programs offer you generous income, accommodation, travel, immersive Mandarin classes, and meals. Our team have an excellent reputation in the industry and will match your skills to your opportunities and expectations. Please click Go Abroad China Gap Year Program for details. For those of you who want to give back to the community, Go Abroad China offers some of the most meaningful travel and volunteer experiences right here in China, fulfilling the needs of both locals in unideal situations and giving you a valuable opportunity to get involved in our social improvement efforts. Without a doubt, one of the most effective ways to get to know local people and understand them is to mingle with them in their daily life, all the while making a lasting impact in the community. Please click Go Abroad China Volunteer Program for details. Our programs are fully customizable and can be tailored to suit your goals and needs. Be it where you want to live, when you want to come, what you want to do while you are here, we can create the perfect program for you. Mix-and-match your experience by combining different programs to create the life-changing experience you want. Go Abroad China can arrange a range of programs in Beijing, Shanghai, Xian, Qingdao, Dalian, Nanjing, Hangzhou, and Shenzhen. Each of these cities has many opportunities to explore China’s rich cultural history, see historic landmarks and experience China as a local. Go Abroad China can plan your program around your timings. Start when you want to and finish when you want to. We have short-term programs that range from four weeks through to 12, a semester program, a year-long program or you can even come for summer or winter. Arrange your stay around your holidays, your work schedule or however it suits you. Please click Go Abroad China Customized Program for details. Continue your studies, or work and travel while learning the most spoken language in the world through an immersive language program that will fast track your Chinese language proficiency and take your life in a whole new direction! Our programs are all-inclusive. They cover the costs of insurance, visa support documents, transportation, courses, excursions, accommodation, study materials and more. We continually compare our prices and make adjustments to ensure you get the best possible price. We also aim to pass on as much savings on to you as we can. Our team is here to help you out 24/7 with any assistance you may need whether it’s day-to-day support or support relating to your studies or internship. With over 600 partner companies to choose from, we rarely cannot find placement for our applicants. If we can’t find an internship you like, we’ll refund your deposit. We'll work hard to make sure you have the time of your life experiencing China as a local - you’ll get to live, work and play in your chosen city; make global connections and tour China.